Although not new to the internet but hopefully to some of the readers here, is what can only be deemed the best way to waste your time at work ever. Imagine the humor/randomness of your best friends combined with a free MMO that is browser based and will not destroy your life. 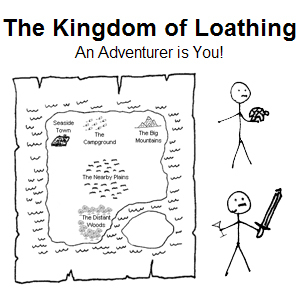 Kingdom of Loathing is a game where you adventure as one of many goofy classes such as a Turtle Tamer or a Disco Bandit, out to save the world filled with stupidity. Meat is the currency and you drink cocktails to beef up your stats. It has pets, equipment, clans, the whole shebang. I just restarted as a Turtle Tamer, hit me up sometime. My name is Shikoku88Henro. And yes those are screen captures of the actual grafix, how awesome is that. EAT IT Unreal 3 Engine! Get your adventuring on at KOL. 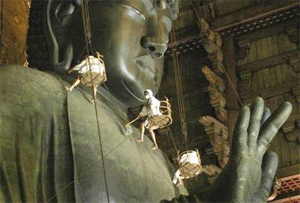 Every year in Nara, the Japanese break out the scrub brushes and clean up the 14.98 meters high, 500 ton Buddha that sits in the Daibutsu-den at Todaiji temple. They use ropes and basks and collect all the dust that has settled onto the Buddha. The temple itself is home to the Kegon school of buddhism and the grounds are home to Shika deer, regarded as messengers of the gods in the Shinto religion, that roam the grounds freely. Get your Buddha cleaning on.